I was looking through my old sketchbook and happened across this rash of drawings which chronicled my early time at Marvel, just after my run on GHOST RIDER with Jason Aaron. Specifically, they were the birth of the idea of PUNISHER: FRANKENCASTLE, and the process of fine tuning it to be both what I wanted, and something that the high-ups at Marvel would get behind. Rick Remender and I have worked together for many years, and we were trying to cook up a really big and really weird event with our pal Jason Aaron. Rick had some ideas for a gigantic war with Dracula, with a handful of rough-and-tumble headliner superheroes, and we had concocted the idea for Dracula's secret weapon to be a newly rebuilt Frankenstein's Monster, powered by Ghost Rider's Spirit of Vengeance. I though it would be really cool to make his body like a locomotive, with a big furnace and and a greasy engine belching smoke and fire. I was doodling around trying to flesh out this hotrod idea and i thought what if Frank Castle's ruthless and well-trained brain was put into this monster to make the ultimate weapon? In a flash of brilliant idiocy, the name "FrankenCastle" popped into my head, and I immediately called Rick. He was all about it, and informed me that he was about to have an opening in PUNISHER that could allow us to retrofit a lot of this pitch for use in the main Marvel universe book. Shortly afterward, i cobbled together this ramped-up full-body shot. i basically tried to take every element of the existing old Deathlok design, and crank it though a filter of my influences, from horror to Lobo and 2000AD comics. The arrangement of all the elements of his original design stayed intact, but i tried to give each one a new interpretation. Axel Alonso was the PUNISHER editor at the time, and he loved to go against the grain. Rick pitched him our ridiculous idea and he ushered us aboard. Through some confluence of perfect conditions or divine providence, we had found the exact right ears to hear our ideas, and had the perfect lead-in to put them into action! Axel saw my concept drawings and said for it to work, it definitely had to feel like Punisher first and foremost. So, i set forth on cobbling together some of these ideas into something visually cohesive and polished enough for the book. My first draft leaned much more toward the Monster side of things. 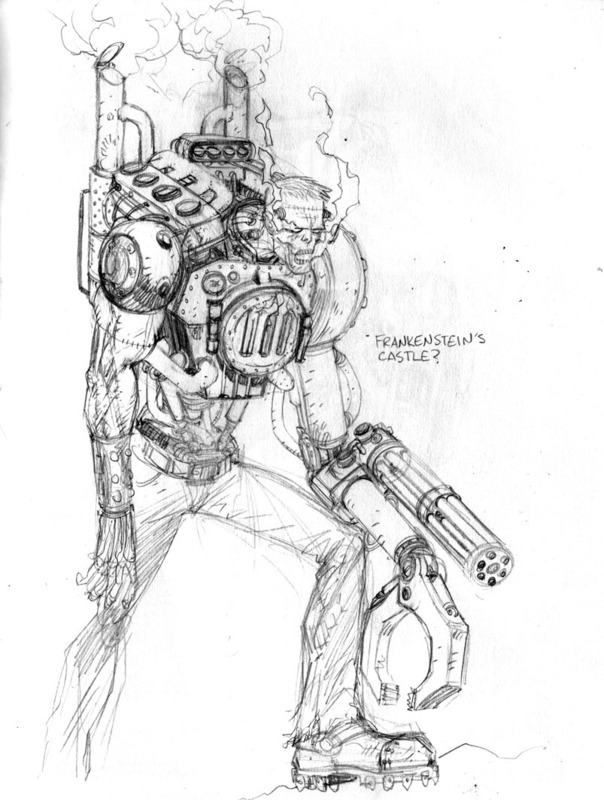 The costume was classic Frank, but the man inside was lanky and dessicated, not to mention heavily augmented, as i had cannibalized most of my Deathlok design for the project at hand. I merged the electrical insulators with the hotrod engine from my earlier monster design, and more or less transferred all the other elements directly over to Frank. Marvel liked the direction i was heading but felt i needed to go way more toward the Frank Castle everyone knew and loved. I toned down the death in his face considerably and bulked him up a bit, trying to strike a better balance between Frank Castle and the monster. At their request, i ditched the massive robot claw. I hated to do it, but i agreed that for him to ever heal and return to normal, it made sense (as much as any of this can make sense) that he not be missing entire limbs. They much preferred this version, but still did not want to see Frank's face so disfigured. So, i cooked up one last version that kept his lips intact and struck what i ultimately believed was the balance we had all sought. They still expressed concerns about his lankiness, and wanted a more squat bodybuilder physique. I assured them i could do this, and proceeded to purposefully ignore the request, drawing it as I saw fit for the rest of the time, with no regrets on my part or complaint on theirs. 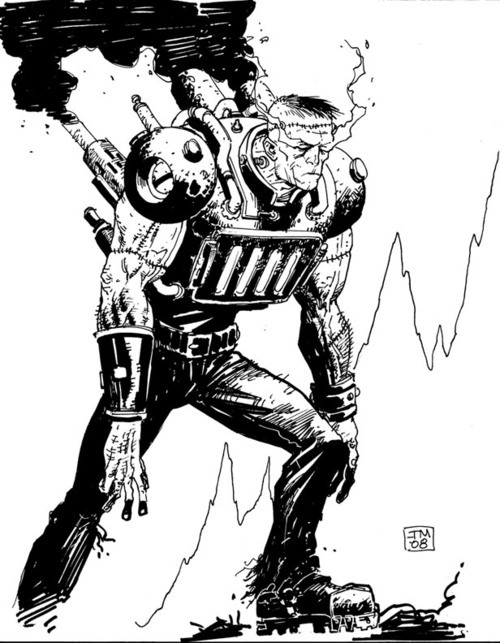 The villain of the series was originally intended to be the late Ulysses Bloodstone, only partially recovered from his long-ago death by volcano, but so angered by Frank and the monsters that he had to jump into action early. For reasons still not entirely clear, we were disallowed from using Ulysses, and instead cooked up an analog replacement, a brand-new old monster hunting cohort of Bloodstone's. In his human form, he was basically a Victorian mad scientist by way of Hammer's Peter Cushing. In his current fighting form, however, he was a charred corpse healing in a vat within a gigantic steampunk robot, who had conveniently also come across a shard of the magical healing artifact, The Bloodstone. I used the furnace, engine, and smokestack elements from my initial iterations of FRANKENCASTLE, with a healthy dollop of Victorian steampunk filigree and flair, heavy on the locomotive angle. In the end, not everything ended up where i had thought it would, but with some tinkering around, not much was left on the cutting room floor, and i was able to cook up some pretty cool (if not headache-inducing to draw repeatedly) designs for FRANKENCASTLE, which Rick and i will forever be proud of as our best effort to produce a damn fine run on the PUNISHER. If you've never read it, you can pick up your very own copy of this massive collection over in my STORE!